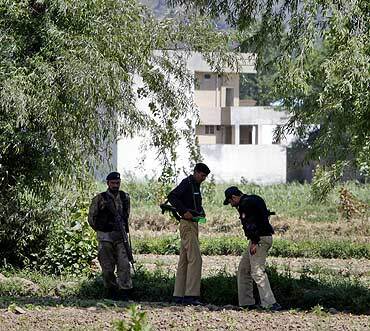 Pakistani troops laid an extensive security blanket over Abbottabad in northwest Pakistan shortly after United States forces killed Al Qaeda chief Osama bin Laden, cutting off access to the compound where the world's most wanted man was gunned down. Scores of soldiers and security forces ringed the compound in Bilal Town area of Abbottabad and sealed roads leading to it, preventing reporters and TV camera crews from approaching the site. The compound is located nearly 800 metres from the Pakistan Military Academy, one of the country's main training facilities for army officers. 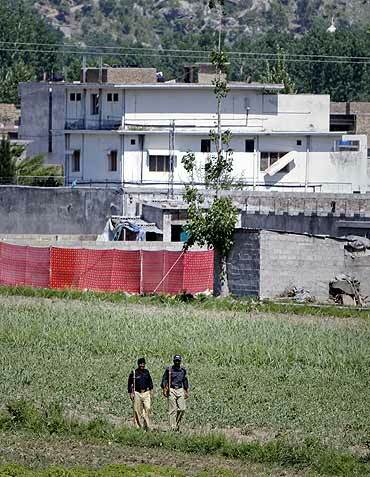 Most of the residents of Bilal Town, a neighbourhood located a short distance from the Pakistan Military Academy, are civilians and businessmen. Several well-off persons who fled the Bajaur tribal region after the army launched anti-militancy operations also have homes in the area. Local residents were woken up by the sound of explosions and gunfire shortly after 1 am. But they were completely unaware that foreign troops had launched an operation in the area against a high-value target like the Al Qaeda chief. Muhammad Saadullah, a student, told PTI, "I heard several big explosions and firing and got out of bed. I saw two helicopters hovering over the area and then there was more firing." Saadullah said local residents came out of their homes but were told to go back inside by troops who had taken up positions in the area. "This is a very peaceful city and we never expected that something like this would happen here," he said. 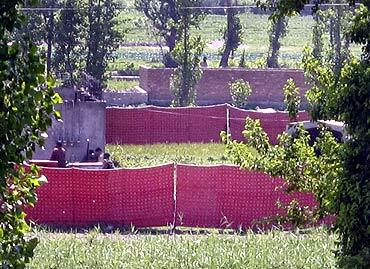 Many residents said they were angry and upset that US troops had carried out an operation in Pakistani territory. Some criticised Pakistani authorities for allowing such an operation to be carried out by foreign troops. Some residents, who did not want to be named, said they were "unhappy" at the death of bin Laden and said it "should not have happened". But officials were tight-lipped about the incident and refused to comment on any aspect of the operation, including the whereabouts of bin Laden's body. US President Barack Obama announced that bin Laden was killed in a targeted operation by a small team of Americans. Pakistan's Foreign Office said US forces killed bin Laden in an "intelligence-driven operation" but did not say whether Pakistani troops were involved. The compound in which bin Laden was hiding out was built in 2005. It had walls that were 12 to 18 feet high and were topped with barbed wire. One of bin Laden's sons, two couriers and a woman being used as a human shield were also killed in the operation, during which a helicopter was destroyed within the compound.